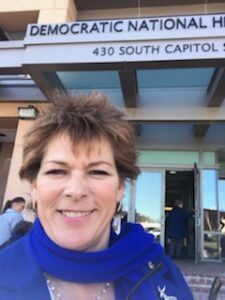 What a great experience it was to represent Idaho during the NFDW Women in Blue Day at the Capital! 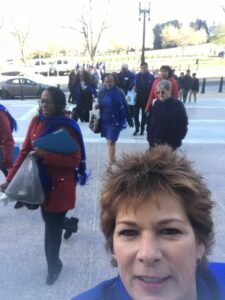 We were a sea of Blue throughout the halls of Congress and around the buildings, with folks stopping us to ask what we were representing. When we answered YOU! they applauded and offered encouragement and thanks. When I arrived in DC the events started out with a bang! Registration and program in our hotel, and a visit from Paulette Jordan’s campaign manager, Gayraud Townsend. Great to catch up and hear that Idaho is still on the minds and plans of those around the country. I met so many wonderful women from around the nation, and found old friends from the Annual Convention last June. Wednesday we hit the ground running—from Congressional buildings through tunnels and walkways we’ve all seen on TV, which was very exciting. We dined in the crowded basement cafeteria and ran to Senate buildings in the afternoon. I spent the morning with the delegation from Mississippi and a woman from Arkansas. We all share the same issues, concerns, values and frankly, bottom of the barrel status in regard to education, living wages, opportunities and healthcare, for our citizens. How many times have you ever said, “Well, as least we’re better than Mississippi?” Well, they say the same about Idaho, and we all deserve so much more. 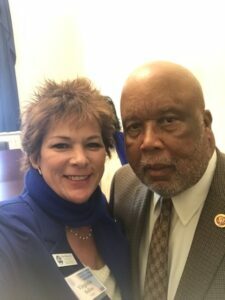 We met with a staff member that showed concern and respect but whose Representative will likely do little and their one Democratic Representative, Bennie Thompson, who was friendly yet challenging. In the afternoon I met with staffers for Senator Crapo and Congressman Simpson, neither of which was able to meet with me in person. I did get to meet with Senator Risch as well as his staff member John Sandy. 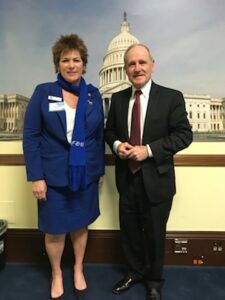 Though Senator Risch showed interest in our concerns, there was doubt regarding Domestic Violence Protection and unpaid caregiver costs. Also interesting was when I asked to take a picture with the Senator, he wanted to know what I planned to do with it! I assured him it would only be used to acknowledge his willingness to meet and hear the concerns of Idaho’s Democratic Women. As the lobbying portion came to an end, our busses brought us over to the Democratic National Headquarters, where we had a great buffet dinner. There were lively speeches and poetry from National leaders and we each gave our State reports. 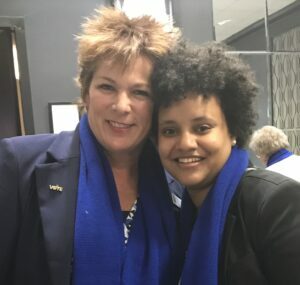 I enjoyed meeting women from New Jersey, Connecticut, Arkansas, Mississippi, DC, New York, Kentucky, Texas and many more! Our final night we visited and networked and shared how this event would help us back home, each in our own areas. I gained new insight into methods and events that Idaho can utilize to grow our base and involvement in the IDWC that I am excited to give to our Regional Directors. The 5 o’clock am trip to the airport was a blur, as was much of the trip home. 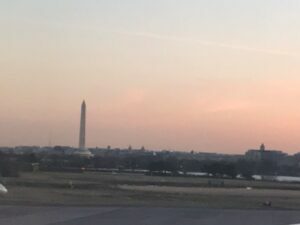 I’m glad I caught this shot of the Washington Memorial as my plane lifted off. Even happier to touch down safe back in Boise and ready to share this trip and the training back at home. Thank you again for the honor of representing you at the National Federation of Democratic Women’s Day at the Capital!